Young children from their birth to age of 5-6 years are very sharp. It is proved that 90% of brain development happens in these initial years of one's life. So, what exactly is development of brain? Brain is said to be developing or increasing its power when there are more and more neurons being formed and even more and more neural connections taking place. And this happens very rapidly at the young age of 0-6 years. In this period, child is always willing to learn something new. It is like they have very immense thirst for knowledge and it has to be quenched in a loving manner. Children in this age group are beaming with energy, always want new toys or games to play with, want innovative or unique things to play with because they always want to learn something new. It is the upbringing of child that matters most in this phase. The more a child is taught, the more she learns and the more she questions and more is the desire to learn that is what is important. So, the thing that plays an important role is the method the caretaker implements to teach the child. It plays a major role in child's learning, her immediate behaviour and even her personality in the coming years of life. Always be mindful of how you are talking and what you are saying to the child. Teach,but, in a lovable fashion. Associate play with learning. Or rather, associate every activity of child with learning. Enact, make expressions, jump, dance do whatever you feel like, become a child when you are with one. Irrespective of how the parent engages a child, the child always finds ways to engage her/himself. The parent may not be willing with every activity that child does. But, do not yell. Do not say 'No'. It is important to observe the immense energy present in every child, their enthusiasm to analyse every single thing and direct that energy in a positive direction. Offer messy things in an organised play. Kids would love to do them. Converting everything they do into an organised play is not only fun and learning but also helps tune the child's brain to look for an organised and interesting way of probing new things. Everyone only speaks about eating a lot and lot but not of eating right, drinking right, walking right and sitting right. So here is a quick guide to what and how one's pregnancy lifestyle should be. When I say should be, I don't mean has to be, because every person is different, each one has her own rate of metabolism, her own levels of absorption of vital supplements and her own unique pregnancy phase. I write this article based on my own and my friends' cousins' experiences. First things your mind encounters when it knows that you are pregnant are questions, doubts, concerns, what to ask whom, how to learn more etc. 1. Don't just eat, eat and eat, but eat healthy. All I have been hearing from elders during my pregnancy is to just keep eating, be it normal meals, sweets, fruits or anything. Well, I would say, eating is definitely important but not over indulging in foods like sweets, deep fries, oily food etc. Eating fruits, vegetables would suffice mother’s and baby’s requirement. Apart from this, there may be food cravings. You can definitely go for your craving but not in excess. Your point of focus should be healthy feeding to the baby rather than satisfying your desire of munching junk. I wonder how many old gens have focused on drinking water. All they say is ‘just keep eating’ and nothing apart from that. There is a chance of salt retention within the body during pregnancy. The main purpose of drinking water is to flush out all the unused particles instead of piling them up within the body which in turn is the cause of swelling. Also, there is around 600 ml of amniotic fluid surrounding the baby which gets replenished regularly. All nutrients and vital supplements from the mother's food are supplied to the baby through the amniotic fluid. Needless to say, babies intake the amniotic fluid. Would you not want your baby to intake fresh amniotic fluid instead of stale one? Also, our body is designed such that, required water for amniotic fluid is in anyway extracted from mother's body and supplied to the sac. This reduces the amount of water present in mother's cells because of which unused salts remain in the cells and cause swelling. Psychologically, man feels happy when the hormone which causes happiness shoots up. Similarly, man feels sad when the 'sad hormone' shoots up. So internally, even before you react with happiness, your mind receives signals of being happy from the hormone levels in body. Now, when you are pregnant, whatever your hormone levels are, are passed onto the sac, obviously because you have the sac within you. Hence, when the 'sad hormone' shoots up in mother's body, the baby receives the 'sad hormone' and when 'happy hormone' shoots up, the baby receives the 'happy hormone'. Hence, it is up to you to decide whether you want to teach your baby 'being happy' or 'being sad'. 4. Know what your body needs and increase its intake. Go for regular medical checkup. Know what the hemoglobin, sugar, zinc, calcium, vitamin levels are in your body. Know what your body needs and increase its intake. Music soothes the neurons in brain. Few people prefer listening to discourses and mythological stories. This is a good option. Sit upright. Do not lean your back. When you lean your back, the entire weight of your baby, chest and your front part falls on the back. This tends to give you back pain. Also, sitting straight helps the baby stay in the right position. 7. Walk straight. Stand straight. Balance your weight on both the legs uniformly. For a quick check, see if the sandals you are using are more worn out at one end than the other for each feet. If it is so, it is time to change your walking style. While walking, place your foot forward in a balanced way. Do not tilt over to the inner side of your feet. 8. Talk to your baby. Make sure the baby is listening to pleasant sounds all the time. Keep talking about what you are doing, how you would treat your baby after birth. Keep telling the baby about his dad-how good a person he is, how he would take up the responsibility etc. Take up any activity/hobby of your interest. Keep talking to your baby as you are doing that. It is indeed the responsibility of mother to spend time in spiritual thoughts so as to enable the unborn achieve its purpose of taking birth. 11. Do not sleep too much. Sleep sure gives you relaxation, but too much sleep does not benefit the mind in any way. Remember to allot time to speak to the most awesome person in this world-your own self. Think, think and keep thinking. Think about how you have spent your time and how you would be spending in future time. Think about how you would be treating your kid. Think about the ‘ideal family’ – you, your partner and your kid. Think about what other great things you can do as a dedication to your baby. I would say, there is no limit to thoughts. Meditation helps inculcating positive thoughts and improves activity level of brain. You feel energized and mind feels activated after a short period of meditation. Stay active so that the baby knows her mom is an active lady. Taking up a hobby helps in this matter. 14. Do not stay silent for long hours. Let the baby know pleasant things happen in the outside world by either talking to him or listening to music. 15. Wear bangles whenever possible. The baby feels good and relaxed by hearing the jingling sound. And there is also scientific evidence that the weight of bangles which falls on the wrist nerve controls blood pressure. Baby can listen to mother's heart beat and recognize mother's voice. It also gives a soothing effect to the baby when in womb as well as after birth.Ask the dad too to do some talking to your womb. In that way, baby will get used to the dad's voice and recognizes it soon after the birth. As pregnancy progresses, people may comment on how you look – either ‘you didn't put on any fat’ or ‘oh my god!! You look so plump’. Brush all of them away. Make sure you are eating healthy food. Keep checking your weight regularly. But do not limit healthy food if you feel you are gaining much. Whatever is the concern, talk to your doctor. Baby responds to any sound it hears. This triggers the neurons to think. Needless to say, thinking more improves the brain functionality. This is true for person of any age. Thinking keeps you active. 19. Do not run behind tablets for common ailments, instead try simple home remedies. Try limiting your daily tablet intake to vital supplements needed for you and your baby. Make it a habit to wake up early in the morning and have a walk under bright sun. This helps build vitamin D in our body from the early sun rays. Walking is best exercise one can do. Walk regularly for 30-40 mins everyday. One can increase the duration depending on the comfort level. Walking helps you maintain flexible muscles, increases blood flow and keeps you active. Make sure it is a concentrated walk. Do not hang on to the phone while walking. Effective inhalation and exhalation occur if it is a concentrated walk. This helps giving fresh air to the baby. Doing household chores is not equivalent to walking or exercise. Squeeze a slice of lemon in water and have it regularly. Lemon water also helps in digestion and is a good source of vitamin C.
Fry some pepper powder in ghee. Mix with rice and have it first in your meals. In a vessel, heat water and add some vaporub in it. Inhale the steam by covering your head with a cloth over the vessel. This clears the throat/nose of any phlegm. Dry roast some ajwain and make it into powder using a mixer. Mix this along with ghee in rice and have it first in your meals. Squeeze a slice of lemon in water and have it regularly. Drink lots of water. I recommend drinking lots and lots of water even before you witness any swelling. The main cause for any cramp is reduced blood circulation. Do some simple rotation exercises which eases off all the cramps. While sitting, keep your leg forward; rotate your foot at the ankle 5 times each in clockwise and anti clockwise direction. While standing, rotate your hands at the shoulder level 5 times each in clockwise and anti clockwise direction. With hands put against the body, rotate just the shoulder points 5 times each in clockwise and anti clockwise direction. On either side, hold your shoulder point with your fingers and rotate the elbows 5 times each in clockwise and anti clockwise direction. Spending more time sitting straight helps in avoiding back pain during pregnancy. However, you may notice that your back feels tired after walking for a long time. Lying down for just 10-15 minutes helps relieve that pain. There is no need to panic. Drink milk. Do not neglect drinking milk. You can immediately feel the difference when there is tooth ache and you increase milk intake. Do not panic. Massage your gums in the vertical direction regularly. You may use any regular gum massaging gel if needed, though not mandatory. You just have to increase the blood circulation to ease any discomfort in our body. Do not neglect drinking milk. This is very important. Baby needs calcium for all its bones to develop. As a mother, you are responsible in supplying required calcium. By nature, our body extracts all the calcium available in the mother’s body (from bones, teeth etc.) and supplies to the baby. This in turn causes weakness to mother either in the form of leg ache, tooth ache or even losing tooth during pregnancy. To avoid all this, make sure you drink milk twice/thrice every day. Make sure you take in lots of iron rich food during pregnancy. Taking iron rich food along with some vitamin C (lemon, orange etc.) increases the iron absorption of our body. Trash Bag, Sanitizer, Hand towels….. Check, check, check! One of the challenges of having a cute, little smiling kid is to be ever-ready with a checklist of items to carry along with you. You step out of the house; baby decides that it is the right time to do a little pooping. You suddenly recall that you have missed something as trivial as a trash bag that’s specifically needed for this purpose. Gee!!! No matter how many times we go through a mental checklist, how many times we check the diaper bag, at times, we simply forget something very important. The following are few essentials that NEEDS to be in your diaper bag. Be warned; the list can grow bigger based on personal requirements and/or emergencies. Definitely needed when outside. How can you have a diaper bag without diapers?? A Plastic mat or a Cloth mat will do well. Quite often we over estimate our speed compared to that of the baby’s. You think you can change a diaper in just seconds and within no time. Just when you change the diaper, you realize that the baby has urinated! This is when the changing mats come into picture. After all, it’s quite difficult to change a diaper holding the baby in one hand. Never ever, ever forget these. For a baby, hygiene is quite essential. To keep your baby rash-free, wet wipes need to be a part of your diaper bag. Required if baby needs to be changed when out. Some of the reasons vary from ‘Baby gets uncomfortable in a particular dress’ to ‘The dress has been stained’. Take a sweater set along if the weather is cold or chilly. The other day, we picked up one of our relatives in our car. She just got off a long bus journey and quite obviously needed to wash her hands before she held the baby. Hand Sanitizer comes in handy in situations like these. You need to feed your baby frequently – sometimes as many as eight times a day! Carry a milk bottle or milk powder, baby food and a water bottle. If your baby is used to Sippy cup, carry one along. Have a clean set of baby feeding tools like bowl and spoon as well. Carry along bibs if you have space left in your bag. To wipe those drools away. Will come in handy in case the baby needs to be protected from pollution or sun. Carry along a baby blanket if you baby is habituated to it or it’s cold weather out there. The rattles/toys work like miracles when baby gets cranky for no reason. The diaper bag becomes your magician’s box when you see baby becoming calm as you keep taking out the toys one at a time! Always carry diaper rash creams, baby lotions, baby oil and other creams. Medicines for common cold, fever and such are important to be carried along. Consider buying two diaper bags – one for short trips and the other for those long journeys. Buy one with clear compartments – saves time when looking for an item. Pack baby food in an additional zip pouch to avoid any leaks. Actions give immense power to the words spoken. show her the water hose in the garden and tell her what it is used for. more than just blabbering and repeating rhymes, songs, ABCs, focus on conceptual learning. Associate a rhyme with a story, make a story for every rhyme, enact whats going on in that story. Make sure every single line is broken into small and simple words that the child can understand. Think from your child’s persperctive. There is no more a batti ratti kind of learning in competitive world. Everything is conceptual. Everything that happens around needs to be probed and understood. Teach the kid not just A for apple B for ball, but, the power of questioning. Tell the child to ask you about anything around you and you will be surprised that she makes it a habit of enquiring about every single thing that improves her thinking ability. You no more have to keep showing objects to the kid and repeating its name. The kid herself will keep asking you what this is what that is and also show you how it is moving without even asking. Do not always focus on diverting her to TV channels, the park, birds, etc and feeding her as and when she opens her mouth by accident only to realize that she’s being tricked into eating. Be honest. Show her the food. Offer her whatever she is interested in and how much ever she takes in. She knows how much food her tummy can handle. A child can never overeat. So, do not keep diverting and dumping food. Dealing with kids requires lot of patience. Never lose your control. Do not yell, shout at your child. Do not show violence. Because whatever emotion you carry is immediately transmitted to your child. If it is a happy emotion, you would love it when your child smiles, laughs and cuddles you back. And, if it is violent emotion, you obviously hate it when you child reacts with the same violence by tantrums, yell and shouts. Because you hate it and you were already upset with your child's behavior, your ego is hurt that your child is yelling at you and you lose your cool and you yell more and your child yells back and this is a viscous circle that ends with your child crying and you losing your mental balance with heavy head and heavy heart. Do you think the child feels good about this? No, in fact, even you do not feel good emotionally. You could have avoided if you had taken a step back and not shouted at your child in the first place. Always think from your child's perspective. Think about all that she is learning when she is doing something that you don't accept (unless it is a socially unacceptable behavior, of course). But, refrain from yelling at simple messy things that the child does. 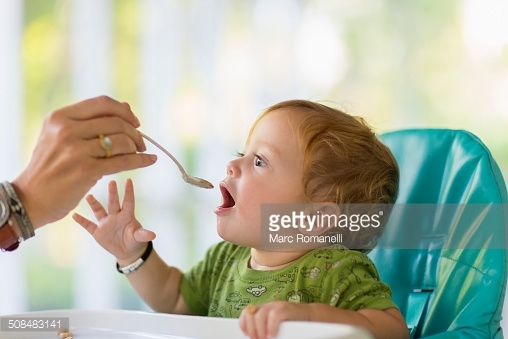 Like, when she wants to put her little hand in rice while eating, let her - she wants to feel the texture of what she is eating, she wants to take that little step of trying to hold the food particle with her fingers and at some stage, put in mouth which is a good thing. Do not yell. You may not like such mess, but, some day, she will learn to eat clean. Until then, let her learn. Do not tend to stop her from discovering those little things around. Is she messing in the kitchen picking up spoons, bowls utensils and throwing in a corner? Do not yell. She is learning how to hold things and observing what sound one specific item makes when it is left free. Always think from child's perspective. You may be knowing that reversing a glass of water makes all the water spill over the floor. But your child, she doesn't even know that there is something called gravity that makes all objects fall to ground. When she wants to put her hand in the glass and play, let her do, she wants to know how water feels like, she needs to learn that water is something that cannot be firmly held in hand and she needs to experience that water will flow down when glass is reversed. Or for that matter, she needs to learn that on throwing any object, Gravity would ultimately make it land on the ground. Until she learns all these seemingly little things, let her try, let her play, let her mess around. Feel her joy and you will understand how she feels. In this period, a child is always willing to learn something new. It is like they have very immense thirst for knowledge and it has to be quenched in a loving manner. Always be mindful of how you are talking and what you are saying to the child. Teach,but, in a loving fashion. Associate play with learning. Or rather, associate every activity of child with learning. Enact, make expressions, jump, dance do whatever you feel like, become a child when you are with one.